The UHV baseball team recently was awarded the Hank Burbridge Champion of Character Team Award by the National Association of Intercollegiate Athletics. 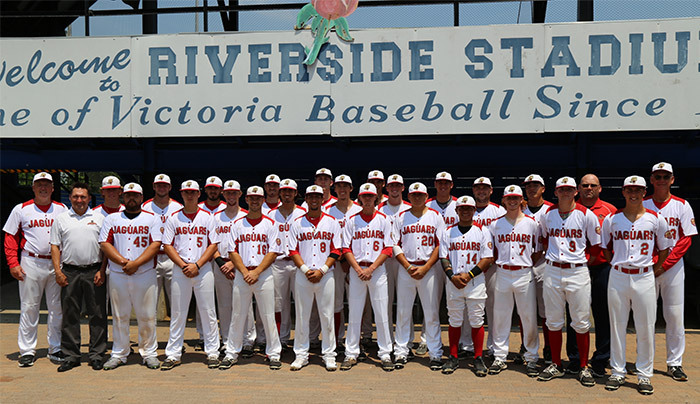 The University of Houston-Victoria baseball team was awarded the Hank Burbridge NAIA Champions of Character Team Award during the 2017 Avista-NAIA Baseball World Series. The award recognizes a team that displays exemplary character and sportsmanship on the field/court, on campus and in the community, including outreach presentations of the five core values of the Champions of Character program – integrity, respect, responsibility, sportsmanship and servant leadership. The UHV team displayed all five of the core values of the program during the course of the season, especially when they saved a family of five from a drowning situation in the Guadalupe River in Riverside Park. Having missed most of spring break due to a long road trip to Hobbs, N.M., for a Red River Athletic Conference series, a few of the team members decided to spend a lazy afternoon in the park cooking hamburgers and hot dogs, and just enjoying the day. They never imagined what the day would turn into. One of the players, Bo Sheridan, noticed the first sign of trouble when an 8-year-old boy came floating down the river on a tube. Sheridan shouted out to the boy if he needed help and without hesitation, jumped in the water and pulled the boy to shore. The team then heard yelling about 100 yards upstream and noticed some people on tubes without life vests hung up in some tree branches in the river. The teammates responded and once again went into the water to save four others, including two children. These players truly displayed their integrity, respect for others, responsibility and servant leadership, as well as sportsmanship in bringing their best to a crucial situation, in saving these five members of the Victoria community. The family showed their gratitude at the Jaguars’ next home game by being special guests of the Jaguars and publicly recognizing and saying thank you to the young men. The 10 players who took part in the rescue included Sheridan, Derek Maciejeski, Nathaniel Pena, Andrew Richards, Blake Henneke, Marco Ynclan, Garrett Gray-Mathis, Jacob Atkinson, Allen Westmoreland and Cesar Martinez Jr. The team is also involved with the Victoria Boys and Girls Club and puts on annual clinics for the kids and stress the importance of the Champions of Character program in all sports.